Please Note: This is NOT glow in the dark tape (phosphorescent)! Shurtape is one of the leading Tape Mfg on the planet. This is very high grade 2" inch reinforced Bright Fluorescent colored duct tape. Cuts easily with scissors or razor knife and tears straight. 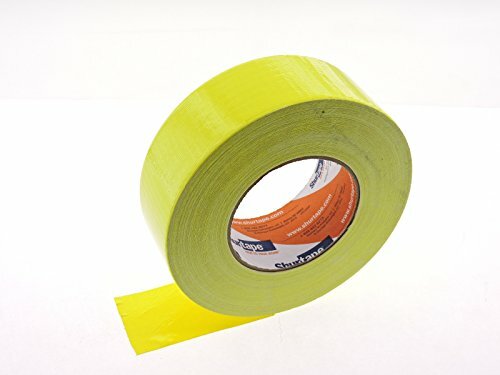 Flourescent duct tape from SureTape only comes in 4 colors: Neon lemon yellow, lime green, magenta pink, and hazard bright safety blaze orange. Please NOTE: Surfaces must be clean, dust free, and dry before application. While the tape is indeed high humidity & water resistant (not submersible) the adhesive will not stick well to moist or dirty surface. Use 2-3 wraps and overlap layers for a smooth wrinkle free long lasting repair. DOES NOT stick long term on cloth or canvas, must apply some other adhesive first and seek a more permanent solution! Other uses: Maintenance, general repair, joint sealing, pipe wrapping, bundling, patching, sealing, mending, insulation projects, temporary closure or flashing, heavy duty packaging, manufacturing, abatement, HVAC, safety color coding, hazard labeling, wire/cable identification or hold down, warehouse aisle or pallet rack marking. Military, Industrial, Construction, Safety, Labeling, Warning, & Manufacturing applications.